Better Dividend Stock: Mattel Inc. vs. Hasbro Inc.
Mattel pays a massive dividend that could be cut at any time, while Hasbro's dividend is both far safer and far less impressive. 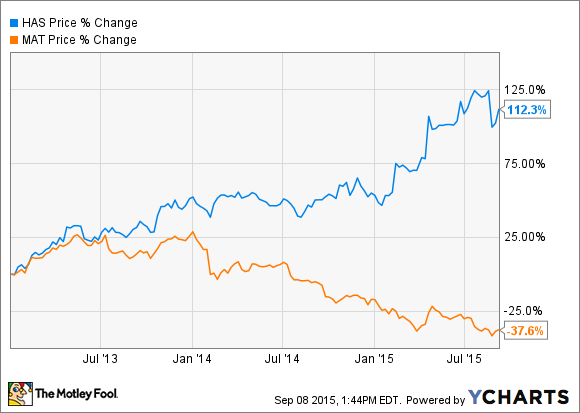 Which is the better dividend stock? Mattel (NASDAQ:MAT) and Hasbro (NASDAQ:HAS) are two of the largest toy companies in the world, collectively generating more than $10 billion of revenue annually. Both companies operate well-known brands; Mattel is best known for Barbie, Fisher Price, and Hot Wheels, while Hasbro sells Nerf, Play-Doh, board games such as Monopoly and Scrabble, and toys based on the Star Wars franchise. This creates an interesting situation for dividend investors. Hasbro's dividend yields just 2.3%, down from about 3.25% at the start of this year thanks to the company's rising stock price. Mattel, on the other hand, yields an incredible 6.6%, the result of the stock price being cut in half since early 2014. 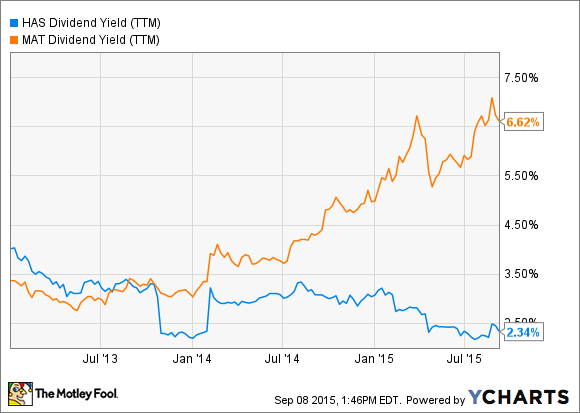 Which is the better dividend stock? It depends. Mattel's profits, no matter how you measure them, currently fail to fully cover its dividend payment, a situation that isn't sustainable in the long-run. Along with its stock price, Mattel's profits have collapsed in recent years, with net income nearly cut in half during 2014. The Wall Street Journal reported last year that bureaucracy at the company had stifled the creativity of its employees, with countless meetings and Power Point presentations slowing things down to a crawl. Mattel's sales declined in 2014, in part because the company has been simply unable to adapt to the shifting market for toys. Hasbro, on the other hand, has been performing extremely well. Profits surged in 2014 as its toys were simply better matched with what customers wanted. Hasbro makes toys based on various popular franchises, like Transformers, Marvel, and Star Wars, and the company struck an exclusive deal to make Disney princess dolls starting next year, a move which ended a 20-year relationship that Disney had with Mattel. And unlike Mattel, Hasbro's profits easily cover its dividend. Which is a better dividend stock? Mattel and Hasbro are stocks for two different kinds of investors. For those looking for a dividend that's relatively safe, Hasbro is by far the best bet. The company's earnings easily cover the dividend, and while the dividend will likely only grow as fast as earnings going forward, given that the payout ratio is approaching 60%, the chance of a dividend cut in the foreseeable future is slim. The downside to Hasbro as a dividend stock is its low yield. Mattel has a far higher yield, but there's a chance that the company will be forced to cut its dividend if profitability doesn't improve, and expecting dividend growth of any kind over the next few years is likely unrealistic. However, if Mattel can turn things around, which I believe it has a very good chance of doing, investors can lock in a 6.6% dividend yield. Neither Mattel nor Hasbro is a dividend stock without compromise. Hasbro has a low yield and dividend growth that will likely be slow, while Mattel may cut its sky-high dividend at any time. Mattel is a high-risk, high-reward option, while Hasbro is a lower-risk, lower-reward alternative. For dividend investors who demand a reasonable yield, decent dividend growth, and a low chance of a dividend cut, neither Mattel nor Hasbro quite fits the bill.